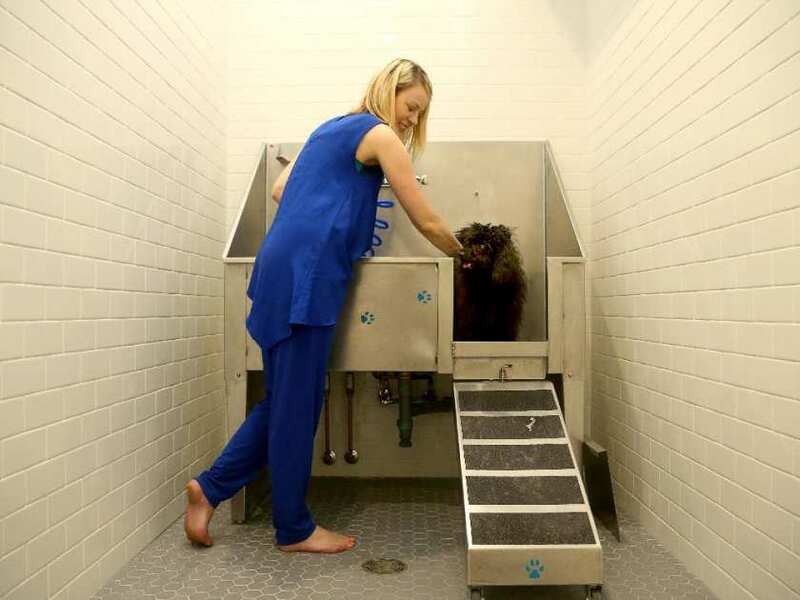 Chantal Smith, sales director Cathedral Hill, gets Zuzu up into the condo’s dog washing station. Spotted: pet friendly city spaces everywhere. Walk down the street and you can spy boutique shops offering a quick walk-by drink for Spot or Bandit. It’s no surprise that condo developers have taken note and are creating pet-friendly condos. Traditionally, condo buildings that allow pets have limited their size, but Chantal Smith of Windmill Development Group says their buildings The Eddy and Cathedral Hill have no such limits. In fact, Cathedral Hill even features a pet washing station or grooming area for pets, located close to a side entrance that offers access to surrounding parkland. The doggy shower has black and white tile, stainless steel and a cute paw print design. A ramp affords access for smaller breeds. Though you can move in with your furry friend, Windmill has some restrictions in terms of behaviour. For instance, pets cannot roam off leash around common areas and if barking becomes a nuisance, the condo board has the right to give you a certain amount of time to address the issue, or ultimately evict your pet. The Windmill message is simple and effective: “We understand that pets are part of your family,” Smith says. As food for thought for developers, a recent Wall Street Journal article documents condo buildings across the United States with such pet-friendly features as rooftop doggy runs, leash-free parks, spas, daycares and social mixers for pets. Perhaps these are some things that will find their way into future Ottawa condo developments. 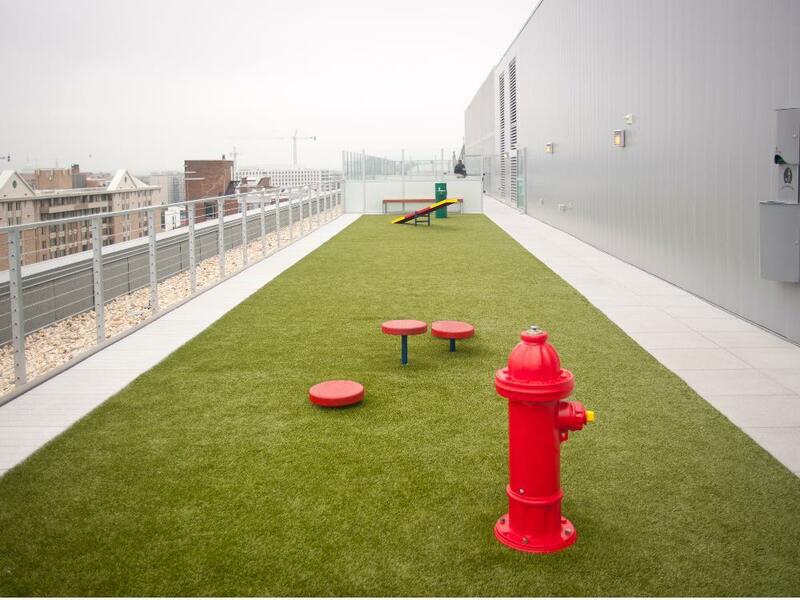 A rooftop dog run is one of the pet-friendly perks at a Washington,D.C., condo called City Market at O.
Colleen McBride O’Brien is a real estate agent who lives at 700 Sussex with her husband and two pets, a cockapoo named Remi and a Morkie (a Maltese-Yorkie) rescue called London. But what about your pooch; will he or she be happy in a smaller space with no grass outside the door? The entire concept of having to go down the elevator with your pet and find some grass is certainly an adjustment if you come from a home with a nice yard for pooch playtime. Some things to consider: what restrictions there are for pets; whether or not you’ll be able to get your pet downstairs quickly in an emergency when the elevator is shut down; and if nearby traffic will restrict your ability to walk your dog during your preferred times. The latter is especially relevant to downtown condos located on main thoroughfares. If you prefer a pre- or post-work stroll, you may be stymied by bumper-to-bumper traffic. Better to head to a nearby park and afford your pooch a longer leash and fresher air. It goes without saying that you should probably scope out the nearest parks and other outdoor facilities, especially if you have larger dogs. When purchasing, it is always best to have your lawyer check out provisions set out by the condominium to find out if your pet (or future pet) is allowed. Look out for weight limits and find out the rules. Marilyn Wilson has been selling real estate for more than 25 years and owns Marilyn Wilson Dream Properties Inc. Christie’s International Real Estate. Reach her through dreamproperties.com.